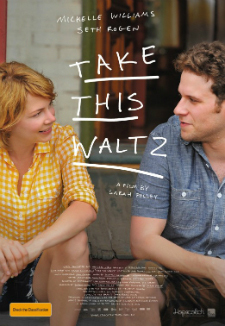 Take This Waltz, is the follow up film for director/writer Sarah Polley (Dawn of the Dead), whose previous film, Away From Her, was released in 2006. Away From Her was a heartbreaking tale about a husband dealing with his wife, who is fighting Alzheimer disease, and its affect on their marriage. Well she seems to love the whole married couple dealing with an issue breaking apart their relationship. But in this case, it’s not a medical disease tearing them apart, it’s someone just wanting more. Michelle Williams (Blue Valentine) plays Margot, a writer for tourist brochures. On assignment, she bumps into a young man, Daniel, played by Luke Kirby (Cra$h & Burn), and they keep bumping into each other on the way home. And to top it off, she finds out that he actually lives in same neighborhood, just a few houses down. And with that reveal, she also tells him that she is married, to Lou, played by Seth Rogen (50/50), who is also a writer, a cook book writer, who is currently into chicken. Are you looking for something that will make you think that you have been dosed with a weird drug in your popcorn butter? Well Splice will do that without a doubt. If you are looking for an odd trip through the world of science fiction with a mix of morality and touch of suspense, than this is definitely your movie. Adrien Brody plays his normal out there character, Clive, that we have all started to expect out of him. We also get Elsa, an odd almost sadistic character portrayed by Sarah Polley. Along with these two human characters we also get Dren, a heavily CGI creature played by Delphine Chaneac and Abigail Chu that will probably keep you thoroughly weirded out throughout the entire movie. So if you are a fan of movies like Alien or Predator, than get ready for a very interesting ride through cloning and other ethical dilemmas. Science fiction will definitely not be revolutionized by this movie, but it is an interesting movie that gets the audience to ask a lot of questions of the world and themselves. Overall I had a good experience with this very rare quality sci-fi flick and would definitely recommend it to friends who don’t mind a very weird experience at the movies. Well whether or not you are ready for it, it is that time again SPOILER TALK! The following are my spoiler-filled thoughts about the movie and you should definitely stop by the comment section and leave your thoughts as well. 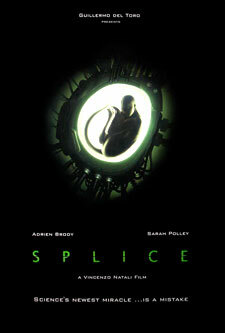 Splice is a movie from producer Guillermo del Toro that’s been around for a while now, but with only words and a few very intriguing and creepy images to go by. The fate of the movie is still yet to be decided, and each and every day that passes by seems to point more toward the movie getting the feared direct to DVD treatment that great looking movies like Mike Dougherty’s Trick ‘R Treat have been getting. 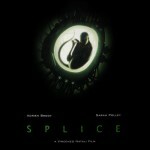 Whatever the fate of Splice may be, it now has its first clip from the movie. Basically, the premise is that there’s a pair of scientists who find a way to genetically engineer a new living being by splicing together human genes and animal genes. As you might imagine, the results are a bit…un-natural. The clip that has been released shows the scientists as they deal with a stage of the creature that has escaped. In case you missed them, a bunch of the above-mentioned images were released a while back (Read: New Images From Guillermo Del Toro-Produced ‘Splice’). It helps to check them out and see the spliced hybrid creation before watching the new clip! Click over to the other side to read the official synopsis and check out the video!